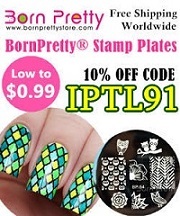 Today I'll be sharing a goodie that I got from BornPrettyStore which is a pretty awesome product. Now to anyone who isn't a nail art person might not understand what a nail art scraper is or how much one is needed. However if you are a nail art addicted you know that sometimes you scramble looking for one because you don't have an plain card lying around or the stamping set you bought came with a metal scraper & you don't want to use that in fear of ruining your awesome plates. However now BornPrettystore has their own clear plastic card nail art scrapers available for sale. Which is AMAZING! I love having one that is specifically made & dedicated to being my stamping scraper & then I have another which is my nail art palette which is completely covered in different shades of nail polish. This product is listed on BornPrettyStore.com as "BORNPRETTY Design Nail Art Scraper 2pcs/SET" & is currently on sale (Oct. 25/2015) for 0.99 cents. Which ones with two cards! WOOHOO! So go grab one while the sales on!